The first thing you need to know is what type of existing windows you are replacing. The first thing to do is remove the screen and open the window. Measure the window width from jamb face to jamb face (see “W” in diagram). Measure three times, at the bottom, middle, and top of the window in case the old jamb is warped. If there are discrepancies between the three measurements, use the narrowest measurement. Your new retrofit window width (W) is dimension “W” minus 1/4 inch. 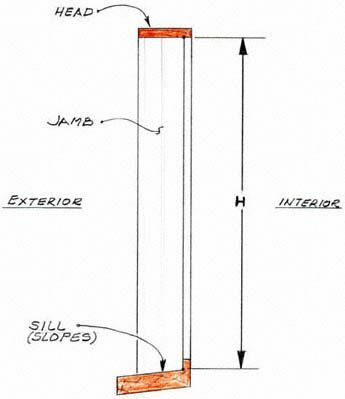 Window height (H) is measured from the bottom lip of the head to highest point on the sloped sill (as shown) Again measure three times, at the middle, left and right sides of the window in case the old jamb is warped. If there are discrepancies between the three measurements, use the narrowest measurement. Your new retrofit window height is dimension “H” minus 1/4 inch. The diagram below is of a single-paned aluminum frame window. Begin by removing the screen and opening the window. This allows you to determine which flange sticks out the furthest. Measure that flange to the same flange on the other side of the window. This will give you the size of the clear opening you will have once you remove all the panels. Measure the widths at the top, middle, and bottom and use the narrowest measurement. Measure the height in the same way in the middle, left and right sides and use the narrowest measurement. Your new retrofit windows size (either width or height) is dimension “D¹” or “D” minus 1/4 inch. For window and door installation in the Denver metro area, call Gravina’s. We also provide free online estimates!